The plasma membrane is made of a phospholipid bilayer. Individual phospholipids are composed of a charged phosphate “head” group and an uncharged lipid “tail” group. Because phospholipids contain charged and uncharged components, they’re amphipathic (they can interact with both lipid and aqueous solutions). Think of lipid and aqueous solutions as oil and water — they can’t really mix and tend to separate. 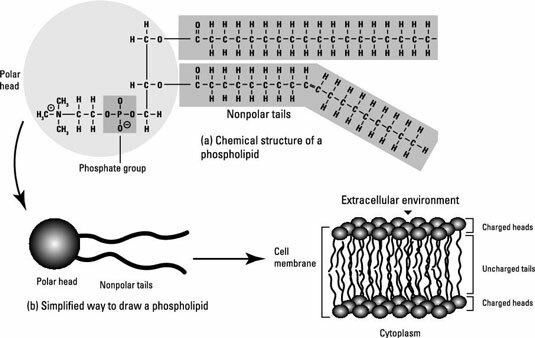 The tails of phospholipids are hydrophobic (repellant of water), so they repel water such that in a solution of water they arrange tail-to-tail to limit their contact with it. This tail forms the inner portion of the membrane. In contrast, the head groups are hydrophilic (attracted to water). They face the outer portion of the membrane and directly contact the environment or the cytoplasm, both of which are aqueous. The layer nearest to the extracellular environment is referred to as the outer leaflet, and the layer nearest to the cytoplasm is referred to as the inner leaflet. The hydrophobic nature of the lipids is what makes the phospholipid bilayer impermeable to large, water-soluble molecules. Individual phospholipids contain a phosphate group attached to a glycerol molecule that is attached to two fatty acid tails. Sometimes additional molecules are attached to the phosphate group of phospholipids. Eukaryotic membranes contain sterols (steroid-containing lipids), such as cholesterol, that strengthen the membrane. Bacterial membranes contain sterol-like molecules called hopanoids, which help strengthen the membrane. The chemical composition of archaeal phospholipids differs from bacterial and eukaryotic phospholipids in four main ways. These differences are a major distinction between the domains. The plasma membrane isn’t all just fat. It’s almost equally composed of protein. Membrane proteins serve many important biological functions, including motility, adhering to surfaces, sensing and secreting signals, and transporting nutrients. Integral proteins are insoluble in aqueous environments and are tucked right in the membrane. Peripheral proteins are soluble in aqueous environments and sit close to the membrane. They contact the membrane itself temporarily or interact with integral proteins. Integral proteins float within the phospholipid bilayer and are able to move laterally, like a buoy in a lake that moves back and forth with the movement of the water. Proteins are mobile in the membrane because the membrane’s consistency is similar to that of cooking oil. The membrane is studded with many proteins that freely move throughout it.